The Maurice River Reaches Map is easy to interact with the simple controls and features provided. Listed below are the key features and descriptions of how they can be utilized. The map is fully draggable. Simply click anywhere on the map and begin dragging your mouse to move the map to specific areas. click to navigate the map "up". click to navigate the map "down". click to navigate the map "left". click to navigate the map "right". click to "zoom in" for a closer look. click to "zoom out" to back away from the map. click to get back to the "default" map setting. click to learn more about that reach. “I made my first haul when I was 11 years old - on the Little Haul," said local waterman Richard Weatherby. Just down river from Mud Haul was "a real small eddy," Weatherby said, adding that his grandfather, father and other local fishermen knew this reach by that name. 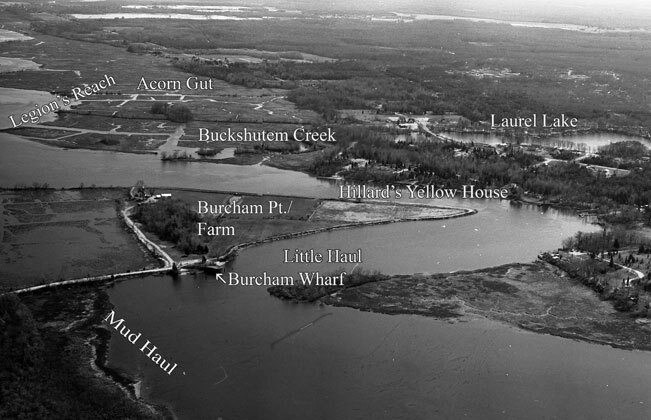 Little Haul is located on the eastern banks of the Maurice River near the Burcham farm. The Polenta Hotel, Jane Galetto said, was right across the Maurice River from the Burcham's point - at the Little Haul Reach, not very far south of where Peter and Jane built their home. 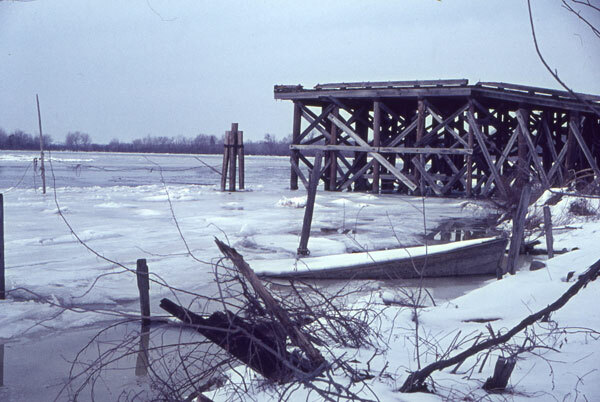 At one time, a wharf edged out into the river at this reach. The wharf was constructed by NJ Silica in 1935. 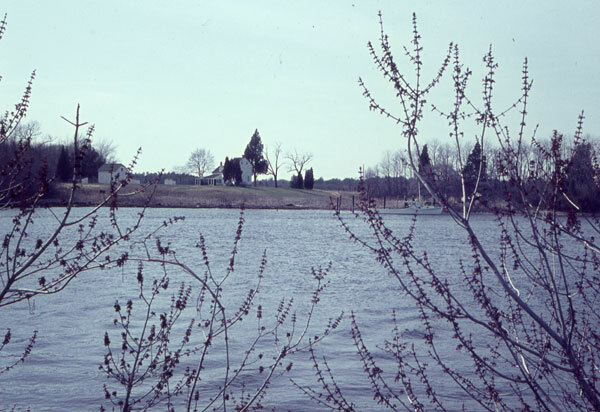 Clarence Wolf of NJ Silica leased the land and riparian rights from Frank Burcham to construct a commercial pier. Wolf planned to transport NJ Silica's sand via the Maurice River rather than pay the increasing cost that the railroads were demanding. The sand company used the wharf only once, but that was enough to convince the railroad to roll back their rates. The sand company never used the loading pier again. 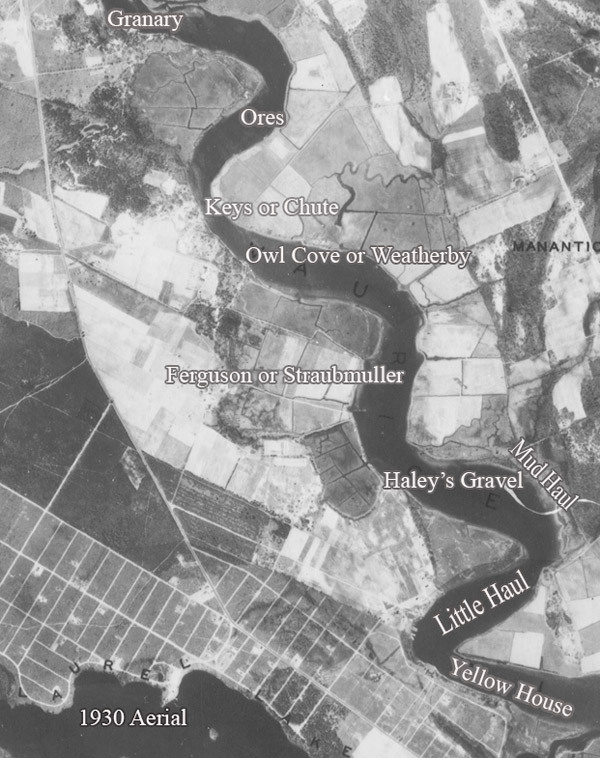 For decades, "Wolfie's Wharf" stood as another landmark on the eastern shores of the Maurice River. Maintaining the long wooden structure was costly for the Burcham sisters, who inherited the farm in 1951. Finally, in 1994, the wharf was demolished. Frank and Joanne Murphine are familiar with the wharf that once sat on the Maurice River at the Burcham farm. While he wasn't familiar with the name "Little Haul," Frank Murphine knew some of the locals who pulled their nets in from there, including Toots Peterson, one of the colorful characters of the Maurice River. Julie Smalley remembered the pier, too. "They had this big high pier and the land came way out to the buoy. If you went out (close to the buoy) you would get stuck," Smalley said. That was something she and her family were mindful of as they navigated their boat up and down the Maurice River. In the 1960's, Smalley and her husband built a family cabin further south on the river at Sweet Meadows. The family spent a good bit of time on the Maurice. "But I never heard any one refer to theses reaches as Mud Haul and Little Haul," Smalley said. In the 1960's, that way of life was already fading into the past. 6/06.